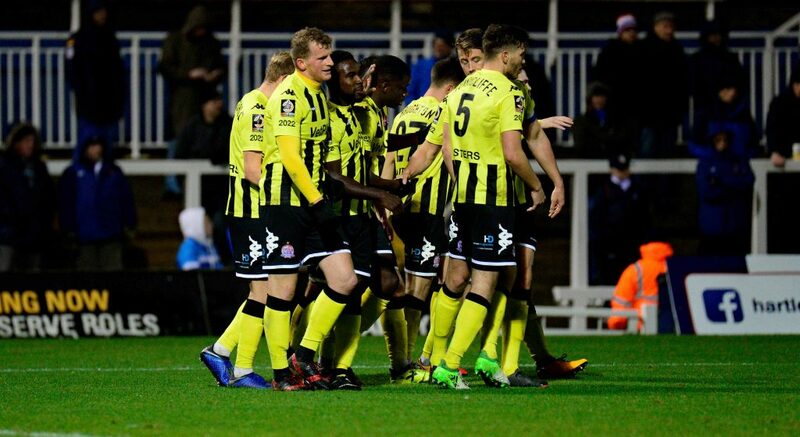 Inspired by a late win on the weekend, and boosted by the arrival of Arthur Gnahoua from Shrewsbury on-loan, the Coasters end November on a more positive note than it started. Hartlepool United, on the other hand, had found themselves in somewhat of an unmitigated free fall. Losing five league games in a row, an exit in The FA Cup in extra-time, and a high-profile falling out between the manager and captain left things precariously perched heading into this fixture. The Coasters made one change, as Danny Williams was replaced with Andy Bond, having shaken off the strain he picked up at Dagenham & Redbridge. Newton returned after illness, whilst Hawkes also made his way into the Pools side. Captain Liam Noble could only make the bench. It was an open start to affairs, with the Coasters first sight on goal coming from an unlikely angle, as Game Toure burst in from the left, firing one from an acute angle to try and catch Scott Loach unawares. Loach was more than equal to it, however, and it was palmed comfortably behind for a corner, as Fylde looked to take a foothold in proceedings. Danny Rowe’s first effort came just a minute after, as Bond successfully laid a speculative ball off to him – but his low, powerful shot skidded left of the post. Andy Bond was at the heart of Fylde’s early work, finding himself in advanced central positions, whilst happy to drop wider to win back possession. The first real chance however eventually fell to the Coasters, as Danny Rowe saw an effort cleared off the line after he cut in and tried to prod it beyond Loach. The ball was fired back into the box and looked to have struck a Pools players’ hand, but the referee and his officials weren’t interested in the claims for a penalty. Pools’ best chance of the first half fell to Donaldson just 5 yards from goal – but the quick nature of it meant he couldn’t get a shot away, and an air shot let Fylde off the hook. A quick breakaway saw Haughton pick out an onrushing Toure, who was in two minds, clipping the ball back for Rowe at the last second. Rowe was unable to fashion a goal-bound effort from it though, and another chance went begging. Just before the interval, however, Fylde made the breakthrough. Croasdale was alert to recycle a chance excellently, playing in Haughton, who’s whipped ball was met by Rowe – who nestled it expertly into the bottom corner, beyond Loach. It was what the Coasters had deserved for their first-half dominance, with chances created aplenty through their positive approach. In truth, the game could have been over early in the second half, as Danny Rowe raced through to find himself one-on-one with Loach in the 53rd minute. Rowe had perhaps too much time to pick his spot, however, and Loach was able to make a great low stop and keep the deficit to just the one goal. The second goal wouldn’t come easily, and the Pools ramped up the pressure for an equaliser. A misjudged clearance from the otherwise unflappable Zaine Francis-Angol afforded Hartlepool a chance to counter. Fortunately for the Coasters, Luke Burke was on hand to make a fantastic defensive tackle on Luke James, just as the Pools forward was about to pull the trigger. In this positive spell for the hosts, Jay Lynch was called upon as Connor Newton’s towering header was sent crashing goalwards. It would have been level, were it not for a save of unbelievable dexterity from Lynch, who tipped the ball onto the crossbar, and the Coasters cleared. At this, Pools’ captain McLaughlin was replaced by Liam Noble, their leading scorer so far this campaign, whilst Fylde introduced their new loan signing Arthur Gnahoua for his debut. And it didn’t take long for him to introduce himself to the Fylde faithful. Rowe found Gnahoua lurking outside the box with a quick pass, who took a touch before sending a low shot goalwards, perhaps taking a lucky deflection its way. From this moment, the Pools had no choice but to attack – and in the 84th minute, the pressure reached the boiling point. A ferocious corner whipped in saw Coaster’s midfielder Croasdale handling the ball whilst jumping for it, with the referee pointing straight to the spot. Liam Noble stepped up and placed the penalty to the bottom left, and whilst Lynch got a hand on it, it wasn’t enough to stop it going in. The final five minutes, which were followed by five minutes of injury time, saw both teams have chances to score. Philliskirk was played through by Rowe in an opportunity almost identical to the one that started the half, but once again Lynch was on hand to deny him. Tempers flared after the 5 minutes added time went up, and Noble went into the book for a dangerous tackle on Byrne that he reacted badly too. Despite Noble’s frustrations, Pools were unable to find an equaliser, and the Coasters were able to head back to the Fylde Coast with all three points. “I’m delighted we won, but I’m a little bit disappointed if I’m honest,” said Manager Dave Challinor. Hartlepool: Loach, Richardson, Magnay, Anderson, Kitching, Featherstone, McLaughlin (Noble 62), Donaldson, Hawkes (Muir 79), Newton (O’Neill 67), James.